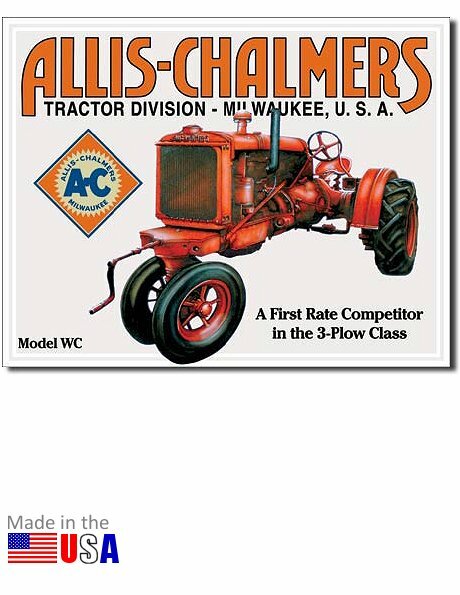 A fantastic decoration piece for your garage or office wall, the Allis-Chalmers Tractor Division - Milwaukee, U.S.A. tin metal sign, goes on to advertise the Model WC tractor, as "A First Rate Competitor in the 3-Plow Class." This is a metal sign, made in the U.S.A. Measures 16 inches wide by 12.5 inches high. UPC: 6-05279-11133-6 | Part No. 1133. Ask a question about "Allis-Chalmers Tractor Division - Milwaukee, USA" Tin Sign.